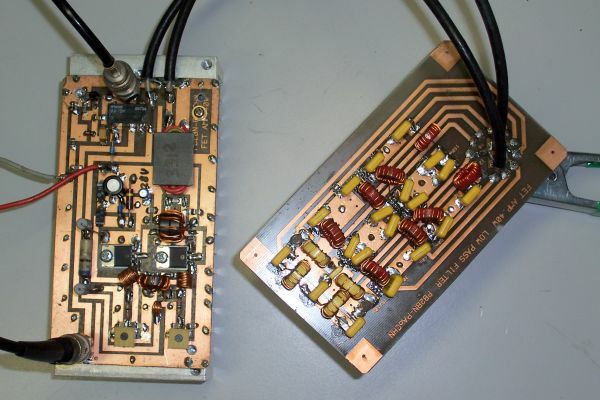 From a friend (Ben, PB2BN), I have got some PCB’s designed for a HF all band linear. He won’t use them in a short time and he knew that I was searching for a simple all band linear design. The design came from the ARRL handbook and using low-cost power MosFETS (IRF510) and it was also including six low-pass filters. After I purchased the desired T-50-x toroids and the BN-43-3312 balun core from the ‘Toroid king’ (very cheap and fast delivery!) and the IRF510 from Conrad Electronics, I start building. The first test was not successful, very unsymmetrical output. No wonder, I put a de-coupler capacitor on the FET output in stead of a power line. After correcting that, the amplifier works fine. I was using a 7 dB attenuator to reduce the 5 Watt output of my transceiver to the 1 Watt input for the amplifier to get about 40-45 Watt of output. In the meantime I construct an ‘In-line Monitor’, designed by Cor PA0CHN, to measure the output power of the amplifier. The in-line monitor is a very simple but very useful device to measure high power outputs. It consists of a piece of coax mounted between to connectors (coax shield is mounted only on one end!). The coax is put through a FT…-43 core and on the core are 21 windings, one end to the metal box and the other to the monitor connector, closed with 50 Ω (2 x 100 Ω). The attenuation of the monitor output is 30 dB. 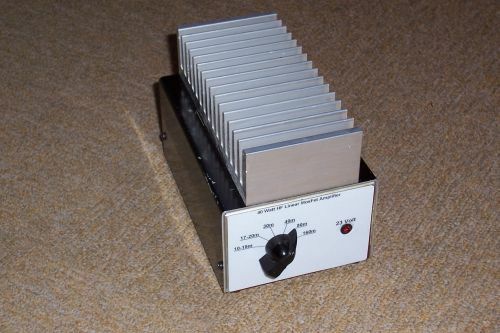 Below you see some pictures of the amplifier PCB’s and when the amplifier is ready for use. 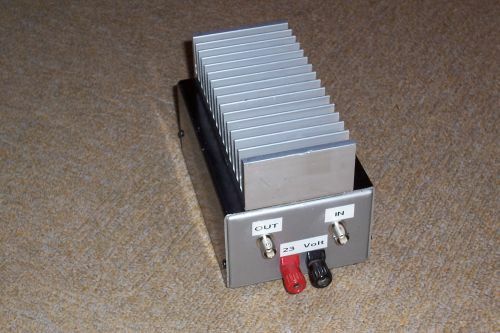 On the ‘Dag van de Radio Amateur’ in 2011, I found a very nice 24V 2.5A power supply (switched). This power supply was originally used in medical equipment, so it doesn’t produce any HF noise and it is sealed in a heavy aluminum case. Also the DC lines are very clean. The power supply has Brand / Type: SCIE AMS 24 2500 GD.